I am forever on the lookout for quick and easy recipes that can be made on a weeknight after work when I want something relatively healthy and inexpensive. One of my favorite resources for these recipes is Eating Well. This recipe was inspired by Eating Well’s recipe for Peanut-Ginger Noodles. I’ve bumped up some of the aromatics, and changed the vegetables to my taste. I can’t imagine a vegetable that wouldn’t be good here. 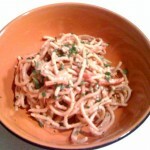 I shied away from using whole wheat pasta and went with a high-fiber pasta instead. There are some instances where I didn’t want the nutty flavor of whole wheat pasta to clash with whatever sauce I’m making. This dish is very filling. Its got great textures – the crunchiness of the vegetables, the chew of the pasta, the creaminess of the sauce – and great flavors – the heat from the ginger, and the comfort-foodiness of peanut butter. This recipe makes enough for dinner with plenty leftover for the next day. 1. Bring a large pot of water to boil for the pasta. 2. Mix together the peanut butter, soy sauce, garlic, chile-garlic sauce, and ginger in a large bowl. Set aside while you make the pasta. 3. Salt the boiling water if desired and cook the pasta until it is just slightly underdone, then add the vegetables to the water. Cook a minute or two more until the pasta is done, and drain the pasta and vegetables in a colander, rinse with cold water to stop the cooking, and continue to drain well. 4. Add the pasta and vegetables to the bowl with the sauce, add the scallions, and toss thoroughly. Note that it will look like you have too much sauce to start with, but have no fear! Place the bowl in the refrigerator for about an hour, tossing the noodles every 20 minutes or so. The sauce will become thick and cling to the pasta. Serve cool, or it may be warmed in the microwave a few seconds if you prefer. This entry was posted on Wednesday, November 18th, 2009 at 1:35 pm	and is filed under Recipes. You can follow any responses to this entry through the RSS 2.0 feed. You can leave a response, or trackback from your own site.